Blade hand dryers are the next generation of electric hand dryer. They're quiet, hygienic, affordable to run, and made with cutting-edge hygiene technology. We've got the biggest brands at the lowest prices, so check below for more info. Blade hand dryers are an increasingly popular choice for business owners looking to update their washrooms. They can help your business be more efficient, reduce waste, and keep your customers more comfortable all at once. Blade hand dryers usually cost a little more to buy, but they more than make up for this in energy savings. They use a powerful blast of air that’s focused into an invisible ‘blade’ shape (hence the name). This is a far more efficient method of drying hands, meaning the dryer doesn’t need to be powered on for more than a few seconds at a time. Many of them go one step further, giving you a cold air setting to further increase energy savings. Cold air hand dryers allow you to switch off the heating element inside the unit (some, like the Dyson Airblade, don’t come with a heating element at all), dramatically reducing running costs. Even without a heating element, blade hand dryers are usually still powerful enough to effectively dry hands in under 10 seconds using only the force of their airflow. Most modern blade hand dryers will be able to dry a pair of hands in just a few seconds. Hands-in dryers are usually the fastest as they blow air onto both sides of both hands at once. This is good for your energy bills as we mentioned above, but it’s good for your staff and customers, too! The faster someone can dry their hands, the quicker they’ll be out of your washroom. Nobody wants to spend time queuing for a hand dryer in a busy washroom, so a speedy hand dryer will ensure people are in and out as quickly as possible. 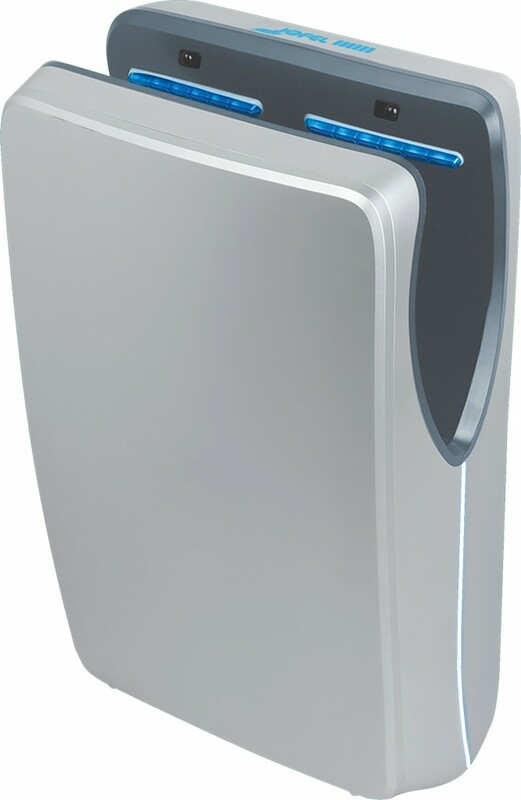 If you’re looking to reduce the time it takes to clean your washroom, a blade hand dryer could really help you out. How? Well, as they dry hands very quickly, they’ll dramatically reduce the time people spend dripping onto your floor! This makes your washroom much safer, more hygienic, and much easier to clean. Hands-in dryers usually come with a drip tray to catch water as it’s blown off your hands. This means the floor around your hand dryers will be kept in pristine condition! Blade hand dryers are a relatively recent invention. That means most of them are designed with a modern, minimalist look that’ll fit nicely into most washrooms. Our range includes hand dryers in a range of designs and finishes, so you’re sure to find something that looks great in your bathroom. The design of some models goes beyond simply looking nice, though; Jofel’s Tifon hand dryers are made from anti-bacterial plastic. This means they kill any bacteria that come into contact with them, so cleaning them is simply a matter of wiping them down! If you want to greet your staff and customers with a branded hand dryer from one of the world’s most trusted companies, the Dyson Airblade gives you a name you can trust. They’re available in both hands-in and hands-under varieties; the hands-under model is easily the most compact blade hand dryers you’ll find, making it ideal for very small washrooms. The Airblade’s main benefit, though, is its incredible airspeed. It uses patented Dyson technology to move massive volumes of air at high speed, blow drying hands without the need for a heating element. This ensures your energy costs will be kept as low as possible, which is good for the planet but even better for your wallet! Just as Dyson first made their name with incredibly innovative products, FFUUSS are seeking to do the same with their one-of-a-kind HD series blade hand dryers! They use the patented Air Hugs system to allow users to insert their hands from the side of the unit as well as in the top. This makes them perfect for disabled toilets as they can be easily used by wheelchair users. The FFUUSS HD series also use smart air nozzles to create a wall of air around your hands. This means they’ll catch 100% of drips that are blown off your hands, making FFUUSS the only completely drip-free brand of dryer! It comes with a host of other smart features, too; including Bluetooth connectivity – which allows you to monitor its performance remotely – and softly-coloured LED lights that are specially designed to make you feel relaxed. No matter what you’re looking for in a hand dryer, you’ll be able to find it here. Whether you want something affordable, cheap to run, easy to maintain, a recognised brand, or something that brings a touch of class to your washroom, we’ve got you covered. Below are just a few features you might want to consider. Models with a HEPA filter will catch bacteria before they’re blown onto your hands, making them much more hygienic. IP ratings determine how well-sealed an electrical appliance is against water and dirt. Models with a higher IP rating (such as IPX4) can be installed nearer to sinks. Some hand dryers are Quiet Mark-approved, meaning they run more quietly. This makes them more suitable for places where low noise is essential, such as an autism-friendly washroom or a care home.